We spent a leisurely ten days in Brisbane last month. On our first morning we chose a cafe at Eagle Street Pier on the Brisbane River for breakfast. The setting was magnificent, a perfect way to start a warm sunny day, watching joggers and self important execs hurrying along the boardwalk while we sipped fresh juice and good strong coffee with our breakfast. Day two was pretty much a repeat performance of the first, but on the third day the the cafe’s menu changed. The concept was exciting, but my plate of food had the potential to be so much more. There was toast topped with shredded beets that may or may not have been pickled, a soft boiled egg and a few fresh baby chard leaves. From the first mouthful I began thinking about ways to make this unlikely marriage of flavours much more exciting. Pickled beets can be delicious. Like most Anglo Aussies of my age, beetroot speaks to me of childhood and summer. Vinegary sliced beets from a can appeared in salad sandwiches, with salad on a plate and for many, it’s still the quintessential ingredient in a hamburger. Canned beetroots are okay, home pickled beets so much better. 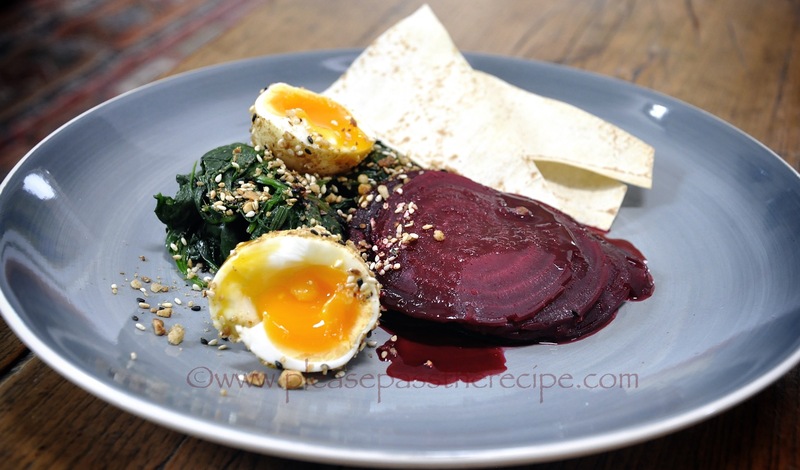 Wilted spinach dressed with garlic oil, my special pickled beets, a dukkah coated soft boiled egg and pita crisps for crunch set was a delicious start to my day. Slip the skins off the beetroots and cut into thin slices. Lay the beet slices in a wide pan and set aside. Mix together the remaining ingredients and pour over the beets. Place the pan over a medium heat, bring to the boil, then reduce the heat and simmer uncovered for 10 minutes. Transfer the beets to a container with a lid, pour over the pickling liquid, then cover and chill for 24 hours before using. These pickled beets are also delicious lightly warmed and served with lamb or duck, or added to a real Aussie burger. I love beets! have got to try this,looks yum! Definitely my cup of tea! Love the recipe, simple, healthy and so yummy!!! This is such a gorgeous and creative breakfast Sandra! I’m definitely a fan of beetroot on burgers, but this dish is in a league of it’s own. Hope that your family in Brisbane remained safe with the recent storms and didn’t have anything damaged – such crazy weather! I wonder what summer will have in store for us this year?? Thanks Margot, yes all’s well with the family in Brisbane. We’re all beetroot fans and love it in many and varied ways…. Well – just happen to have everything required in the kitchen, even tho’ white wine vinegar will have to do. Have pickled many a beet but have not used orange nor ginger! Onto my weekend-to-do list!! Sounds good . . . I think Eha you’ll enjoy the extra buzz the orange and ginger add to the beetroot..
Beautiful! I love the eggs with the beets! That sounds lovely Sandra. A very nice breakfast indeed. Oh yum, I am glad I am not the only person in the world who loves beetroot and egg. But homemade pickled beets? Hoo ha Mrs Recipe! Trust me, canned beets don’t taste so good after you’ve had the real deal! Hmm, sounds tasty…but I must admit to preferring my beetroot without ginger. Cooked first by boiling in water for about an hour, then when cool it’s skin removed. Sliced, lemon rind grated over it and some Crème fraiche, then roasted in the oven….. Your visit to Brisbane was healthier than ours. We found a little cafe off Queen Street that made great coffee and even greater almond croissants. At least we got to walk it off each day. I hope you enjoyed your stay as much as we did. I love the look of the beetroot by the way. As you said, tinned beetroots was a staple once upon a time, and this way of doing looks so much better. Slowly we’re getting to know Brisbane and always have a great time exploring. It has many hidden gemsAn almond croissant would tempt me too….. I think you most definitely improved upon your brekkie Sandra! I can almost taste it. YUM. You are the queen of interesting pickles. Orange zest and ginger sound like the perfect partners for beets. I’m glad your pickled oranges showed up in the ‘related’ thumbnails. Have been meaning to try those for ages. This entry was posted on November 27, 2014 by ladyredspecs in Breakfast and Brunch, Dairy Free, Food, Gluten Free, Light Savoury Dishes, Preserves, Side Dishes & Salads, Vegan, Vegetarian and tagged beetroots, ginger, orange, pickled beets, salad.